Karwaan, starring Irrfan Khan, Mithila Palkar and Dulquer Salmaan, has got a new release date yet again. The Ronnie Screwvala-produced film, which was scheduled for August 10 release, will now hit the screens on August 3. News agency IANS had reported that the release date has been been advanced "to enjoy a clear two-week solo run at the box office". Makers revealed that from the distributor's point of view, it is a lucrative release window. Karwaan revolves around the lives of three oddballs from different walks of life, who are thrown together on a bizarre journey. Each character undertakes the journey only to find normalcy in their lives. The first poster of the film released earlier this month, which featured all the three actors from the film. The tagline on the poster reads, "3 Lost Souls...2 Dead Bodies...A Journey of a Lifetime ..."
Karwaan marks the debut of Malayalam actor Dulquer Salmaan, who is best known for his performance in films like OK Kanmani and Charlie. Mithila Palkar, who is known for her web series Girl In The City and Little things is making her Bollywood debut with the film. 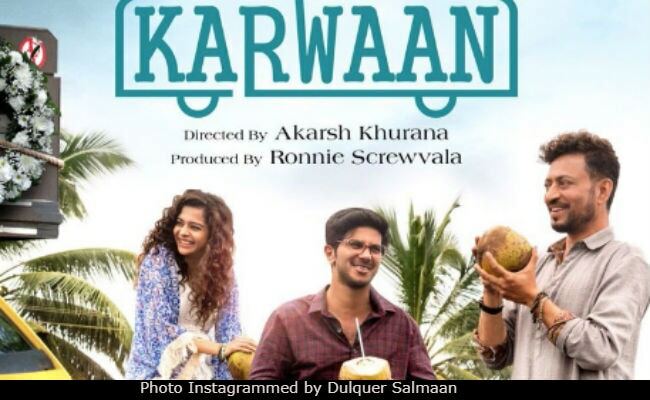 Directed by Akarsh Khurana, Karwaan has been widely shot in the beautiful locales of Kerala. Mithila Palkar had earlier shared a few pictures from the sets of the film on her Instagram account. One of the pictures shared by the actress features her with Irrfan Khan and Dulquer Salmaan with a caption: ""Here we go! My lovely co-actors don't have any idea what they've gotten themselves into by obliging for pictures." Last seen in Blackmail, Irrfan Khan has a movie with his Piku co-star Deepika Padukone, which will be helmed by Vishal Bhardwaj .